When you make a homeschool schedule you will want to make a plan that works for you. Besides teaching your children you will have outside commitment and chores to do. The ages of your children also determine how you use your time. You will need to think about when you will teach. Some families use the traditional public school schedule where you start in September and finish sometime in May or June. Others parents home school year around. Think also about your daily routine. You do not have to start school at 9:00 in the morning. If your children prefer to work in the afternoons you can. To make a plan you will need to look at what commitments that your family has during the week. So grab a piece of paper and let’s begin to develop a plan. We all have chores and commitments that we need to do. Write down what you expect to get done each day of the week. Think of ways you can save time. You can save time cooking by eating cereal and juice for breakfast. Then for lunch have sandwiches and raw vegetables. Using the slow cooker can also save time cooking. Also think about teaching your children to help do chores. In the beginning teaching your child to work takes time. When your children are older they can take on responsibility for meals and cleaning. The next step is to write down your outside commitments. Look your list over to see if you can cut anything out. Then write down the ages of your children and what they can do independently. 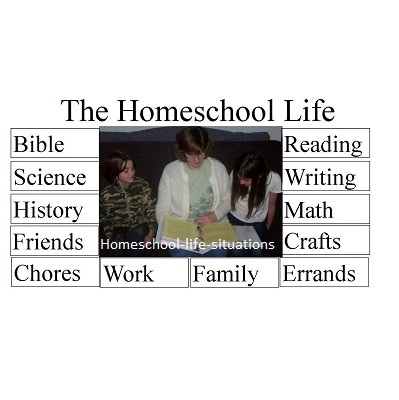 Here is more information about making a homeschool schedule for different ages. When you have preschoolers in the house your homeschool schedule should be very relaxed. There will be days when your preschooler will not want to do school. She may be ill or just tired. Sometimes you will be too ill or tired to teach. Sometimes in the afternoons we did chores together. Some days we went to the library. Other days we went visiting or to the park. Sometimes we would do crafts together. As my children grew during the elementary years we needed more time for reading and writing. In later grades we worked for about an hour after lunch. This homeschool schedule worked for many years for us even when I had a new baby. The baby was either napping, in the swing, or on my lap. As the baby grew we used a play pen for part of the time. When the younger children were old enough to listen to stories we included them in Bible reading. If they could sit still long enough they stayed for science and history lessons. We were also flexible. If the baby was fussy we didn’t have school. In the summer we left the workbooks behind and went on field trips. We went hiking on nature trails. We visited museums. We also read lots of books during the summer. By the time my two older children were in middle school I needed them to be more independent. I had them do classes on the computer while I taught my younger children reading and math. When my older children were in high school our life changed again and I had them take alternative classes through the school district. Today the younger children are in middle school and high school and again our homeschool schedule changed. I spent a year with the Old Schoolhouse review crew. We did reviews in the summer so I now do “school” in the summer and take our vacation in the winter. While you are teaching your child life still happens. New babies are born. Grandparents and other relatives die. A parent may become ill. You may move to a new location. There are a lot of different situations that can alter your homeschool schedule. Don’t worry if your child does not finish the curriculum. Some days you will feel like doing school other days you won’t. Try to do as much as you can but don’t worry about the days when you can’t work. Your child will learn a lot about life from his experiences. There may even be a time when you will need to place your child in a school. As your children grow your child will probably be involved with outside activities. Some people keep a family calendar so that everyone can keep track of what is going on in the family. My advice when making a homeschool schedule is to pray and learn to be flexible. Then you can make a family routine that you can live with.